Hello Blainreaders! I'm writing as I gaze out onto a nasty ice-storm that has paralyzed my street and a lot of Southern Ontario. Most of the folks who were in Toronto for the Blues Summit conference and Maple Blues Awards have made their way back to their home turf (and they got out of town just in time). 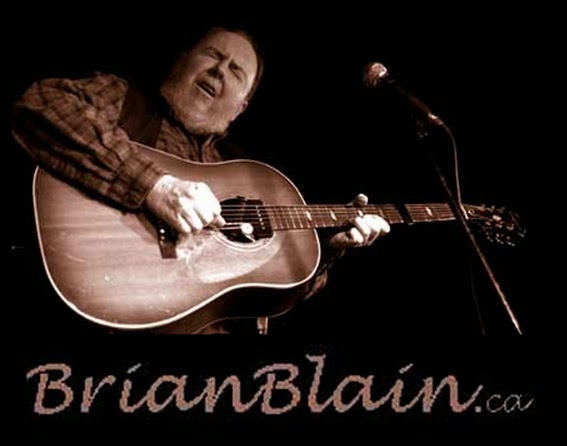 Thanks to all of you who took a moment to comment on the Blainletter (mostly asking how come there hasn't been one recently :-) but I try to get one out every month, especially if I have a gig to promote. Every few days I get a notification that someone has subscribed. I don't know where they heard about it and it's never a name I recognize. The most recent is from a guy at a furnace company so rest assured next time I need a furnace I'll be calling you! This Saturday at the Old Mill Campfire Jam I welcome Chris Murphy, who signs off every message "I'm a Happy Guy" and he's also a very "Busy Guy" in his hometown of London. He's a fabulous sax player as well as vocalist, frontman, bandleader, festival organizer and a big part of the London blues scene for many years. If you were at the Maple Blues Awards, he was the guy honkin' on the baritone sax. And I've asked bass player/MIDI magician Patrick Merner to come back again. The day after, Sunday February from 1-4, I will be doing a free show at a unique venue, Opticionado – a high-end optician on Dundas West. He has music events every month and it's always a lot of fun with free snacks and libations. 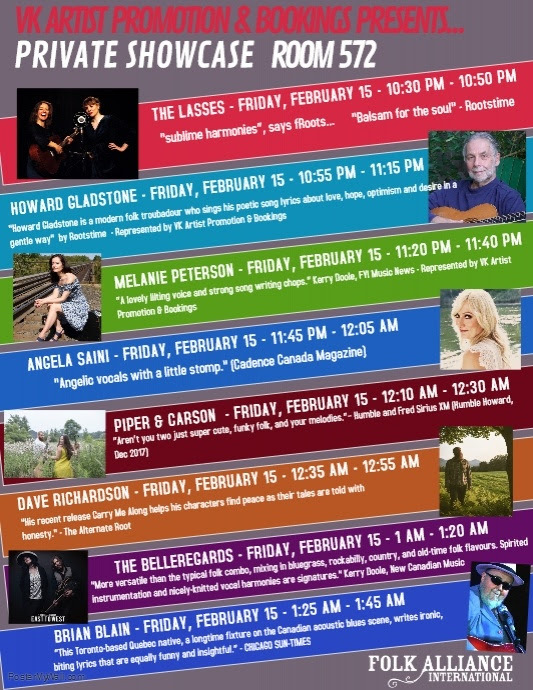 I'm in Montreal from February 13-17 for the International Folk Alliance Conference. Imagine a couple of thousand earnest young folksingers taking over the Queen Elizabeth Hotel on the 50th Anniversary of John & Yoko's "Give Peace a Chance" bed-in. All conference attendees and all our folk friends around the world will join in a live-streaming performance of “Give Peace a Chance” from their own beds on Saturday, February 16th at 9:30 am ET. Watch for it on Facebook Live HASHTAG #GiveFOLKaChance. Then at the end of the month it's the Winterfolk festival (Feb 24 & 25) where I'm participating in 3 workshops and doing a concert set at the Black Swan at 5pm Saturday (the 24th). I'm hoping Patrick will be along for some of these gigs. 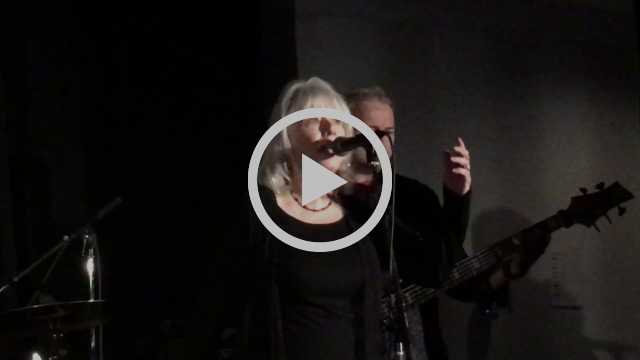 He's a great bass player and then some…We played together at the Blues Summit showcase (along with Michelle Josef on drums) and he got a lot of notice from our showcase where we pulled out all the stops and fired up the laptops & loopers for the last tune. I wish more people had heard our set but we were the first band in the programme and half the crowd was still partying at the opening reception – and those who did come in to the showcase hall were still in schmoozing mode so there was a lot of chatter in the background. At the end of my set I did suggest to the crowd that people came a long way to hear these artists and it would be great if they took their conversations into the hallway. Several people told me they were annoyed by the chatter and one presenter even said, "I wish more artists had the courage to admonish their audience like that." It's hard to list all the highlights from this action packed week-end but beyond the music it was such a pleasure to catch up with Stephen Barry and even had a nice lunch with Harry Manx before he crashed exhausted from some intense bad-weather touring in Quebec (but Harry, the intrepid road-warrior that he is, is back there now doing more of the same). Harry & Steve Marriner gave a stellar performance at the Maple Blues Awards gala. Sue Foley's guitar playing just keeps getting better and better and I love it (we are both big fans of Gatemouth Brown) but the guitar player who really caught my ear was the guy Lindsay Beaver brought up from Austin, Brad Stivers. He's got a great touch. It was wonderful to see the return of Tri-Continental and was happy to see my buds Madagascar Slim and Bill Bourne renewing their project with Lester Quitzau. The Summit even featured a bona-fide rock star, Myles Goodwyn. I got to tell Myles about the time I was on tour opening for April Wine and abrubtly quit the tour when I had enough of people shouting "A-PRIL-WINE-A-PRIL-WINE" throughout my set (he didn't remember any of this). I remember because his manager Donald K. Donald had done a lot for me and was more than a bit upset about me bailing. It was one of those "you'll-never-work-in-this-town-again" moments. And I never did - still can't get a gig in Quebec, but maybe that will change – I made some good contacts at the Summit. 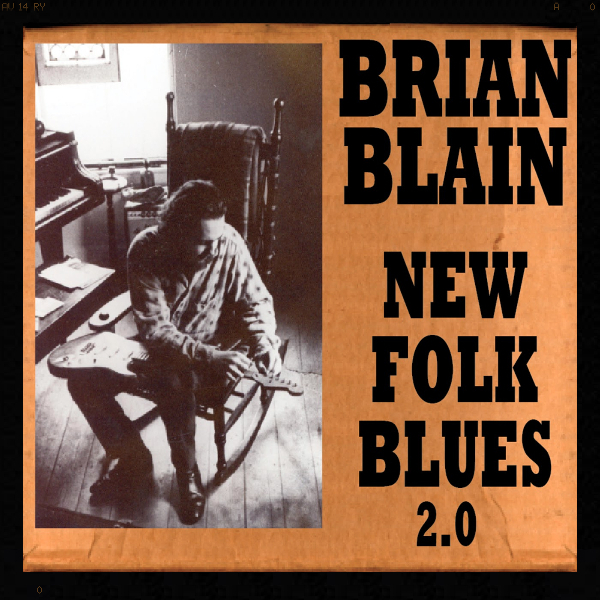 Copyright © 2019 Brian Blain, All rights reserved.